One of my favorite set of posts from last offseason was the conference recap using SDPI. SDPI is a statistic I borrowed from Eddie Epstein that he used in his book, Dominance, to rank pro football's all-time greatest teams. SDPI stands for Standard Deviation Power Index and looks at how teams performed relative to the league average (or conference average in this case) and standard deviation in terms of points scored and allowed. The more standard deviations a team is above the mean, the better they are, and vice-versa. Here is the link to last year's WAC post. As you can see, SDPI was a useful tool in predicting some of the rise and fall among the WAC's teams. In the interest of providing an even better offseason analysis, I will now be conducting another SDPI, this time for yardage. It is calculated in the same manner as the SDPI for points, but will obviously be measured against the conference mean and standard deviation for yards. Think of it this way: Points are the end result and yards are the means to that end. Thus, looking at both sets of data, we can get an even better idea about which teams are likely to improve or regress in 2008. If you want the meat of the article, skip this next paragraph as it just gives an example of how the SDPI is calculated. The mean points scored and allowed for all WAC teams in conference play was 246.33 points. The standard deviation for points scored was 81.18. The standard deviation for points allowed was 46.96. Louisiana Tech scored 199 points in WAC play and allowed 237. Their offensive SDPI was -0.58 = ([199-246.33]/81.18). Their defensive SDPI was 0.20 = ([246.33-237]/46.96). Their total SDPI for points (SDPIP) was -0.38 which ranked 6th in the conference. The mean yardage for and against for all WAC teams in conference play was 3342.33 yards. The standard deviation for yardage for was 631.76. The standard deviation for yards allowed was 339.76. Louisiana Tech gained 3119 yards in conference play and allowed 3430. Their offensive SDPI was -0.35 = ([3119-3342.33]/631.76). Their defensive SDPI was -0.26 = ([3342.33-3430]/339.76). Their total SDPI for yards (SDPIY) was -0.61 which ranked 5th in the conference. To refresh your memory, here are the 2007 WAC Standings. The actual standings are pretty in line with the SDPI standings. 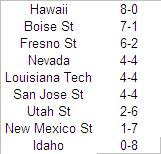 Hawaii and Boise State dominated their WAC foes in 2007. As we'll see later, that's par for the course for the Broncos. Fresno State's third place finish in SDPIP aligns pretty well with their third place in the actual standings, but in SDPIY, they were actually sixth--ahead of only rif-raf Idaho, New Mexico State, and Utah State. The Bronocs scored the most points in WAC play, and the Warriors gained the most yards. Boise State has led the WAC in scoring in 5 of their 7 years in the league. The Vandals and Aggies staged an epic pillow fight in the last game for both teams--a 24-19 Aggie win in the Kibbie Dome on November 24th. Nevada and Hawaii combined to gouge the Broncos' defense for 1213 yards. The other 6 WAC schools managed only 1638. It should come as no surprise that both Aggie squads combined to go 3-13 in WAC play. Pat Hill's Bulldogs will likely be getting a lot of love in the preseason magazines after closing with victories over Kansas State and Georgia Tech sandwiched around a win over New Mexico State. And why not lavish the Bulldogs with the title of 'Team to Beat'. Quarterback Tom Brandstater is back for his senior season, 2/3rds of the running back committee return, 5 of 6 players who caught more than 10 passes are back, and the offensive line in nigh intact. What's not to love? For starters, the team's leading tackler and defensive leader, linebacker Marcus Riley is gone, as is the leading sacker, Tyler Clutts. Secondly, the Bulldogs statistics point to a middling WAC team looking to take a step toward the top of the league, not a team already at the precipice looking down on their opponents. Fresno State finished 6th in the WAC in yards per game and 7th in yards allowed per game last season. They were outgained on average by about 55 yards per game. That number is not artificially inflated by their losses to Boise State and Hawaii. They were outgained in 6 of their 8 conference games (Louisiana Tech, Nevada, Idaho and San Jose State were the other 4). Thirdly, Pat Hill, despite his great success in Sillicon Valley, has never won the WAC. And finally, Boise State. 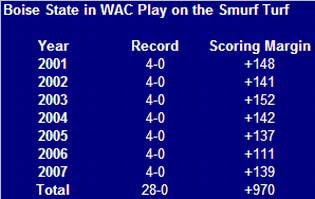 Here's what the Broncos have done to WAC teams on the Smurf Turf since joining the conference in 2001. In 7 years the Broncos have been in the WAC, they have played 3 one-score games at home. They defeated Tulsa 27-20 in 2003, Hawaii 41-34 in 2006, and Nevada 69-67 in OT this past season. The Bulldogs must travel to Boise this season, so in all likelihood, the Broncos will have the tiebreaker over the Bulldogs if it comes to that. With the massive personnel losses in Hawaii, the unsettled quarterback situation coupled with the loss of stellar tackle Ryan Clady at Boise State, and the aforementioned issues at Fresno State, the real darkhorse in the 2008 WAC race is the Nevada Wolfpack. Last season the Wolfpack had the second most prolific offense (in terms of yardage) and the third best defense in the WAC. The 'Pistol' offense should be quite prolific once again and could blow up big time. Quarterback Colin Kaepernick exploded onto the scene with a dazzling freshman year. Kaepernick averaged almost 9 yards per pass (8.8) and threw 19 touchdowns against just 3 interceptions. He also gained 593 yards on the ground, making him a poor man's Tim Tebow. If he can improve his completion percentage (53.8%), he could take another step forward and perhaps set himself up as a sleeper Heisman candidate in his junior and senior seasons. The top receiver (Marko Mitchell) and rusher (Luke Lippincott) are also back as well as 4 starters from the offensive line. The Wolfpack do lose 3 of their top 4 tacklers plus their best defender, linebacker Nick Fuhr, but the offense should make up for most of the shortcomings of the defense and keep the Wolfpack in the conference race. With non-conference games against Texas Tech and Missouri, don't be surprised if most observers have written off the Wolfpack in mid-September, only to have a late November home game against Boise State decide the WAC Championship. June Jones. Gone. Colt Brennan. Gone. Quartet of fantastic receivers. Gone. Tyler Graunke proved himself to be an admirable replacement for Brennan last season, but the Warriors' offense will experience some growing pains in 2008. The schedule is pretty tough too. The Warriors must face Boise State and Fresno State on the road in WAC-play, but that's not the worst of it. The Warriors open the season in Gaineville against the Gators, a game that should be uglier than the Sugar Bowl debacle. Two weeks later they travel to Corvallis to take on Oregon State. Finally, the Warriors close the regular season at home against Washington State and Cincinnati. Getting back to a bowl game would be a big accomplishment for Greg McMackin in his first year on the job. Time to Bury Mumme Ball? In 3 seasons in Las Cruces, Hal Mumme has posted an 8-29 record (3-21 in WAC play). 4 of those 8 wins have come over teams that do not play Division IA football. Mumme was given a pass in his first season, an 0-12 debacle, because he didn't have his players. In 2006, quarterback Chase Holbrook, who followed Mumme from SE Louisiana, became eligible and the Aggies finished 3rd in the WAC in yards per game. Big things, or at least a bowl game, were expected in 2007, but the Aggies struggled mightily. Mumme's offense was actually below average in WAC games, finishing 5th in the league in yards per game, about 19 yards fewer then the 'average' WAC team. New Mexico State has some positive indicators heading into 2008. Their turnover margin, second to last in league play at -5, is chief among them. It also stands to reason that Mumme's offense and Holbrook in particular (he is entering his senior season) could improve and lead the team to a bowl game. Still, SDPI ranks the Aggies 8th in one measure (yards) and 9th or dead last in another (points), so the Aggies have a long way to go. If the Aggies don't get to a bowl game, it may be time to cut ties with Mumme. He's done much worse so far than his predecessor, Tony Samuel, did in his final 3 seasons. One of my favorite set of posts from last offseason was the conference recap using SDPI. SDPI is a statistic I borrowed from Eddie Epstein that he used in his book, Dominance, to rank pro football's all-time greatest teams. SDPI stands for Standard Deviation Power Index and looks at how teams performed relative to the league average (or conference average in this case) and standard deviation in terms of points scored and allowed. The more standard deviations a team is above the mean, the better they are, and vice-versa. Here is the link to last year's Mountain West post. As you can see, SDPI was a useful tool in predicting some of the rise and fall among the Mountain West's teams. In the interest of providing an even better offseason analysis, I will now be conducting another SDPI, this time for yardage. It is calculated in the same manner as the SDPI for points, but will obviously be measured against the conference mean and standard deviation for yards. Think of it this way: Points are the end result and yards are the means to that end. Thus, looking at both sets of data, we can get an even better idea about which teams are likely to improve or regress in 2008. If you want the meat of the article, skip this next paragraph as it just gives an example of how the SDPI is calculated. The mean points scored and allowed for all Mountain West teams in conference play was 187.44 points. The standard deviation for points scored was 39.02. The standard deviation for points allowed was 55.02. Air Force scored 228 points in Mountain West play and allowed 164. Their offensive SDPI was 1.04 = ([228-187.44]/39.02). Their defensive SDPI was 0.43 = ([187.44-164]/55.02). Their total SDPI for points (SDPIP) was 1.47 which ranked 2nd in the conference. The mean yardage for and against for all Mountain West teams in conference play was 2912.44 yards. The standard deviation for yardage for was 383.35. The standard deviation for yards allowed was 528.98. Air Force gained 3151 yards in conference play and allowed 3260. Their offensive SDPI was 0.62 = ([3151-2912.44]/383.35). Their defensive SDPI was -0.66 = ([2912.44-3260]/528.98). Their total SDPI for yards (SDPIY) was -0.66 which ranked 4th in the conference. 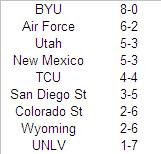 To refresh your memory, here are the 2007 Mountain West Standings. The SDPI standings conform pretty well with the actual standings with a few exceptions. Air Force, which finished second in the conference, rates as the 4th best team (significantly below teams 1-3) in SDPIY. TCU, which finished alone in 5th place with a 4-4 conference record, actually rates as the 3rd best team in SDPIP and 2nd best in SDPIY. If you've been paying attention to the other SDPI analyses, you'll know why. Turnovers. Air Force was tops in the Mountain West with a turnover margin of +9 in conference play, while TCU was tied for 7th with a turnover margin of -5. Max Hall stepped in admirably at quarterback for the departed John Beck. Hall was 30th in the nation among qualifying quarterbacks in pass efficiency (137.71). Freshmen running back Harvey Unga also replaced a senior starter (Curtis Brown), without missing a a beat. Unga averaged over 5 yards a rush and gained 1210 yards. In 2006, the Cowboys only averaged 275 yards in Mountain West play (8th of 9 teams). With 7 starters back on offense, including quarterback Karsten Sween, it looked like they could improve upon those anemic numbers. They did. Sort of. The team averaged 294 yards per game in Mountain West play, but the conference as a whole improved and the Cowboys fell to 9th. The Utes stellar defense made up for their offensive struggles (negative offensive SDPI for points and yardage). The Aztecs had a middle of the pack defense (388 yards and 23.4 points per game) until their last 3 games. Against BYU, TCU, and Air Force (the top 3 teams in the Mountain West in both points and yards), the Aztecs gave up 634 yards and 49.3 points per game. The question to be answered by the Mountain West may not be who will win the conference, but rather, who will beat BYU? The Cougars have not lost a conference game since November 19th, 2005, when they fell at home to arch-rival Utah 41-34. Not only are they 16-0 since, but they have only been outgained in a game twice (in 2006 in road games against TCU and Utah). All the key skill position players return in 2008 as well as 4/5ths of the offensive line. The defense does lose a ton from the back 7 including 3 starting linebackers and the entire secondary (depending upon whom you consider a starter). Even with the personnel losses on defense, the offense may be able to outscore teams (think the 2001 team) and keep BYU not only in the Mountain West hunt, but the also the hunt for a BCS bid. If BYU doesn't win the conference, their appears to be only one other team that can. We'll get to them shortly. The team with the best chance to knock off BYU? The TCU Horned Frogs. TCU has a number of positive indicators in their favor heading into 2008. For starters, they were much better than their 5th place finish in the conference standings would portend. Statistically, they were about the second or third best team. Their record was held down by a poor turnover margin (-5 in conference play and likely to improve) and a poor record in one-score games. All 4 of their conference losses came by 7 points or fewer (total of 18 points) and none of their 4 conference wins were by fewer than 12 points. Like BYU, all the key skill position players, save receiver Ervin Dickerson are coming back. On defense, stud defensive ends Tommy Blake and Chase Ortiz are gone as well as both starting safeties, David Roach and Brian Bonner, but the sophomore corner tandem of Rafael Priest and Nick Sanders should keep the defense in the upper-half of the conference. Plus, and perhaps most importantly, the Horned Frogs host BYU this season. A victory over the Cougars would earn the Horned Frogs the tiebreaker should both finish tied atop the standings. Watch out for TCU. The Running Rebs of UNLV have won only a single Mountain West conference game each of the last 4 seasons. Look for them to win 2 and possibly 3 conference games this season, just in time to save head coach Mike Sanford's job. Sanford is only 6-29 in 3 seasons at the helm of the Rebel attack, so some improvement will need to be shown, lest he be forced to return to the junkyard with his father. Why should one expect the Rebs to improve? For starters, they were not quite as bad as their 1-7 record (2-10 overall) would indicate. The Rebels were 0-2 in one-score conference games, losing to Wyoming by 5 and San Diego State by 8, so with a little bit of luck they could have finished out of the cellar last season. According to SDPIY, the Rebs were actually better than 3 of their conference brethren last season, finishing ahead of Colorado State, Wyoming, and San Diego State. In 2007, the Rebs started a pair of freshman quarterbacks, Travis Dixon and Omar Clayton, who were solid. With another year of seasoning, the possible addition of quarterback and Southern Cal transfer Rocky Hinds, and the return of nearly everyone else on offense, the Rebs will almost certainly see some improvement in their offense which was 7th in the conference in yards and 8th in points. Coming into 2008, the Rebs are a solid bet to have their achievement catch up with their performance. That's not to say they will be competing for a conference title, but rather that they move up out of the basement to the lower-middle of the conference. For Wyoming, the 2007 season began quite well. They destroyed the Virginia Cavaliers, a team that would compete for the ACC championship, by holding them to 3 points and 100 yards. They won 4 of their first 5, with the only loss coming at Boise State, and looked to be contenders for the conference crown. The Cowboys then lost 6 of their last 7 conference games and the season went to the birds. The culprit was the Cowboys complete and utter offensive ineptitude. They scored only 16.3 points per game and gained only 294 yards per game in conference play. The Cowboys could still hang their hat on their defense...sort of. After their 3 point loss to San Diego State on November 3rd, the Cowboys stood 5-4 with 3 games to play. The defense didn't bother showing up to those games. With the offensive talent returning in 2008, the Cowboys have no excuse not to improve. Junior quarterback Karsten Sween is back for his 3rd season as a starter, both senior running backs, Devin Moore and Wynel Seldon are back, and the offensive line returns completely intact. The Cowboys do lose 3 of their top 4 receivers, but with the remaining offensive talent there is nowhere to go but up. On defense, the Cowboys do lose a pair of good defensive backs in Julius Stinson and Michael Medina, but should be strong in the trenches with all the linemen returning including stellar sack-master John Fletcher (10.5 sacks in 2007). Plus, head coach Joe Glenn has proven his coaching wares at 3 previous stops. The Mountain West is a tough conference, but Glenn should be able to right the ship. After floundering for the last few years of Fisher DeBerry's tenure, Troy Calhoun brought the buzz back to Air Force in a big way. The Falcons finished 2nd to BYU in the Mountain West and won 9 games overall, nearly getting to 10 before blowing a big lead to California in the Armed Forces Bowl. The Falcons were one of college football's best stories in 2007. Like most teams that experience extreme turnarounds, luck played a significant role in their rise. The Falcons were 3-1 in one-score conference games and were the top team in the conference in turnover margin (+9). This is not meant to denigrate their fantastic season, merely to serve as a cautionary data point when prospecting forward to 2008. Along with a little less good fortune from lady luck, the Falcons also lose some key contributors. Senior quarterback Shaun Carney made the team go. When he went down in the Armed Forces Bowl, so did the Falcons' chances to spring the upset. His eligibility has been exhausted as has that of wingback Chad Hall, the team's leading rusher and receiver. The Falcons are still capable of getting to a bowl game in 2008, but they will not finish better than .500 in the conference. One of my favorite set of posts from last offseason was the conference recap using SDPI. SDPI is a statistic I borrowed from Eddie Epstein that he used in his book, Dominance, to rank pro football's all-time greatest teams. SDPI stands for Standard Deviation Power Index and looks at how teams performed relative to the league average (or conference average in this case) and standard deviation in terms of points scored and allowed. The more standard deviations a team is above the mean, the better they are, and vice-versa. Here is the link to last year's SEC post. 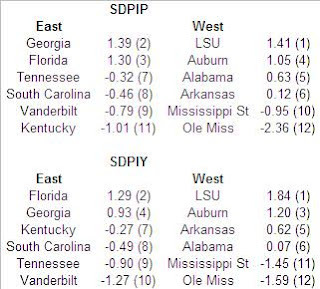 As you can see, SDPI was a useful tool in predicting some of the rise and fall among the SEC's teams. In the interest of providing an even better offseason analysis, I will now be conducting another SDPI, this time for yardage. It is calculated in the same manner as the SDPI for points, but will obviously be measured against the conference mean and standard deviation for yards. Think of it this way: Points are the end result and yards are the means to that end. Thus, looking at both sets of data, we can get an even better idea about which teams are likely to improve or regress in 2008. If you want the meat of the article, skip this next paragraph as it just gives an example of how the SDPI is calculated. The mean points scored and allowed for all SEC teams in conference play (Championship Game excluded) was 217.17 points. The standard deviation for points scored was 59.56. The standard deviation for points allowed was 38.15. South Carolina scored 205 points in SEC play and allowed 227. Their offensive SDPI was -0.20 = ([205-217.17]/59.56). Their defensive SDPI was -0.26 = ([217.17-227]/38.15). Their total SDPI for points (SDPIP) was -0.46 which ranked 8th in the conference. The mean yardage for and against for all SEC teams in conference play was 2926.75 yards. The standard deviation for yardage for was 395.45. The standard deviation for yards allowed was 311.52. South Carolina gained 2975 yards in conference play and allowed 3117. Their offensive SDPI was 0.12 = ([2975-2926.75]/395.45). Their defensive SDPI was -0.61 = ([2926.75-3117]/311.52). Their total SDPI for yards (SDPIY) was -0.49 which ranked 8th in the conference. To refresh your memory, here are the 2007 SEC Standings. The big surprise when it comes to achievement versus performance from the SEC this past season is the Tennessee Vols. The Vols won the SEC East despite being only the 3rd best team in the division based on points and the 5th best team based on yards. Tennessee won the division because of some good fortune in one-score games. They knocked off South Carolina by 3 points in overtime, slipped by Vanderbilt by a single point, and edged Kentucky by 2 points in overtime. In all, the Vols were 3-0 in one-score conference games until the SEC Championship Game where they nearly derailed LSU's title aspirations until a late mistake by Erik Ainge. Another team that defied their performance was Mississippi State. The Bulldogs parlayed a very good defense (5th in the SEC in points and yards allowed), great luck in one-score conference games (3-0), and some timely plays by said defense and their special teams (see below) into a 4-4 SEC record despite the impotence of their offense. Will the spread work against superior athletes? The answer is a resounding 'Yes', at least if you have a quarterback the caliber of Tim Tebow. Note the jump in yardage and points below once Tebow replaced pocket passer Chris Leak. The State of Mississippi: As inept at offense as they are at educashun. The defense has been world class for sometime now, making up for an offense that has not been close to competent the past 2 seasons. Both teams had pretty good offenses that were able to offset their lack of production on the other side of the ball. Is it any surprise the game between these two teams was a 52-50 overtime shootout? The Rebels played in the tougher division and in their intra-division games drew both Florida and Georgia, the two strongest teams from the East. Let me preface this by saying that there are no easy conference schedules in the SEC. That being said, the Dogs and Hogs had much easier schedules than their conference brethren. SDPIP believes Arkansas had the easiest schedule and Georgia the second easiest. SDPIY has their roles reversed. Georgia played in the easier division where only one opponent rated as above average (Florida). In their games against the West, they did face Auburn, the second best team in the division, but they also drew Ole Miss; winner of zero SEC games. Arkansas played in the tougher division, but in their games against the East, drew 3 of the 4 below average teams (Kentucky, South Carolina, and Tennessee). Both teams return a ton of talent on both sides of the ball. You know Florida's key skill position players: Tim Tebow, Percy Harvin, Kestahn Moore, but improvement on the other side of the ball will determine whether the Gators live up to the preseason hype. The Dogs also bring back their fair share of skill position players: Matthew Stafford, Knowshon Moreno, and Mohamed Massaquoi as they look to return to the SEC Championship Game for the 4th time in 8 seasons under Mark Richt. But their real strength last season was the defense. In fact the offense was below average in terms of yards gained relative to other SEC teams. To take the SEC East this season, they need some offensive improvement; in particular some improved quarterback play. The much ballyhooed Stafford finished 91st in the NCAA in completion percentage (55.7%) and 56th in passing efficiency (128.92). LSU was the favorite heading into the offseason, but with the Ryan Perrilloux situation, the top of the SEC West could be in flux. Performance-wise, the Tide were a middle of the pack team in 2007, finishing 5th in SDPIP and 6th in SDPIY. Still, if a few bounces had gone their way, they could have finished with 5 or 6 conference wins. The Tide were only 2-4 in one-score conference games. Improvement in the always fickle 'close games' department would not be a total shock in 2008. 9 starters return on offense in 2008, including senior quarterback John Parker Wilson and running back Terry Grant. Losing receiver DJ Hall will hurt, but Hall practically disappeared over the Tide's final 5 games in 2007. After nabbing 13 catches in a rout of Tennessee, Hall managed just 17 catches the rest of the year. The defense, the strength of last year's team, gets 6 starters back and should remain strong. Couple that with what is widely regarded as one of, if not the, best recruiting classes, and you have all the ingredients, for contention in the SEC West. The Rebels of Ole Miss will be hard-pressed not to improve as they failed to win a solitary SEC game last season. True, they were the worst team in the conference, but the difference in their performance and that of their rivals in Starkville wasn't extremely different. The Rebels' biggest undoing was their turnover margin--an SEC worst -11 in conference play, that further exacerbated their poor down-to-down performance. In all likelihood, that margin will trend back toward mediocrity this season. 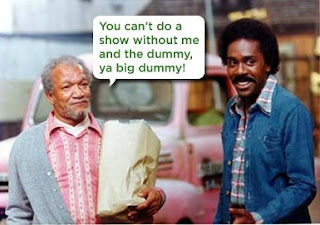 The Rebels also upgraded at the head coaching position, swapping a crazy cajun for a Nutt. Ole Miss probably won't get to bowl-eligibility in 2008, but they should win a few conference games and look toward 2009 with high hopes. The Gamecocks lost their last 4 SEC games and last 5 games overall to finish 6-6 and 3-5 in SEC play. The primary culprit was luck (with injuries, turnover margin, and ill-timed false starts by the opposition) and in their last two conference losses, the defense. That unit brings back 10 starters in 2008 and can only improve. Senior quarterback Blake Mitchell is gone, but he was never a superstar in Spurrier's offense. The conference road schedule outside of Florida is not too challenging (Vanderbilt, Kentucky, and Ole Miss), so the Gamecocks should be headed to another bowl game. 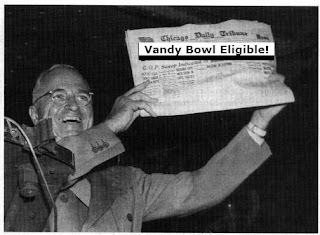 And finally we have Vanderbilt. The 'Dores have been oh so close to snagging a bowl bid over the past few seasons. The main culprit has been an absolute failure to have any success in one-score games. Last year, Vandy was 0-3 in one-score conference games, bringing their record under Bobby Johnson in such games to 4-17, easily the worst in the SEC. Last season Vandy had a pretty strong defense (4th in the SEC in yards allowed and 6th in points allowed), but the offense was non-existent, finishing 11th in both yards and points. The good news for Vandy is that the offense should improve with both Mackenzi Adams and Chris Nickson back to try their hand at quarterback. Receiver Earl Bennett and running back Cassen Jackson-Garrison are gone and their is turnover on the offensive line, but it will be hard for the Vandy offense to be worse than it was last season despite the personnel losses. On defense, the secondary returns intact, and the best players on the line (Broderick Stewart) and in the linebacking corp (Patrick Benoist) are back. Plus the schedule is very manageable. Duke, Rice, Miami (Ohio), and Wake Forest are the non-conference slate, so a 3-1 record is an attainable goal. In conference, the 'Dore have winnable road games against Ole Miss, Missisippi State, and Kentucky, plus home dates with South Carolina and what should be a weakened Tennessee squad. All that has me calling for the unthinkable. Kentucky brought a ton of talent back from their 2006 bowl squad, yet finished with the exact same record overall and a game worse in SEC play. Outside of the monumental upset over LSU, the Cats beat one team with a winning record before the bowl game against short-handed Florida State--Arkansas. Kentucky was outgained and outscored by their conference opponents and once again sported a horrendous defense (10th in the conference in yards allowed and 12th in points allowed). Now quarterback Andre Woodson, running back Rafael Little, receiver Keenan Burton, and tight end Jacob Tamme are all gone. As Sam Cooke said, a change is coming. In terms of yardage, Mississippi State was one of the SEC's worst teams in 2007. They gained the fewest in conference play, and despite a defense that was solid, they were outgained by over 73 yards per game. The defense does get 8 starters back and may be even better in 2008, but the Bulldogs were downright lucky in almost all 4 of their SEC wins in 2007. Auburn outgained them by 110 yards, but committed 5 turnovers in a 5 point defeat. Alabama outgained them by 59 yards, but lost thanks to the game-changing interception mentioned earlier and viewable above. Even the worst team in the conference outgained them by 36 yards, but lost thanks to the punt return shown above. This is not to say the Bulldogs did not deserve their wins in 2007, but it their 4-4 SEC record is not indicative of how they played down-to-down last season. Finally, we have the Tennessee Vols. My very first post on this blog examined Tennessee's extremely fortuitous 2004 season and what it meant for 2005. Tennessee's 2007 season was not quite as fortuitous, but they were still extremely lucky to be playing for the SEC Championship in December. Tennessee was not even close to being the best team in the SEC East in 2007. Their 39 point loss to Florida drives that point home in a way words cannot. Tennessee allowed more yards than any SEC team in 2007. More than the morose units in Oxford and Lexington. That unit may improve in 2008, but it won't become LSU over night. The offense gets everyone back except for the most important cog, quarterback Erik Ainge. And don't forget about the loss of offensive coordinator David Cutcliffe, who left the Vols for bluer pastures in Durham, North Carolina. 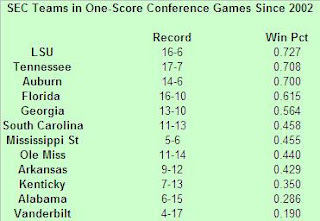 The Vols may very well be better performance wise in 2007, but they will not match their 6 conference wins as the one uncontrollable element--random chance--returns to normal.